This new multi-designer store in Shahpur Jat is where every bride-to-be (and her bridal party) should head to for wedding outfits and accessories. Go prepared to burn a hole or two through your pockets, though. Known for designer stores and ethnicwear boutiques, Shahpur Jat is one of the first places that comes to mind when we think of wedding shopping in Delhi. 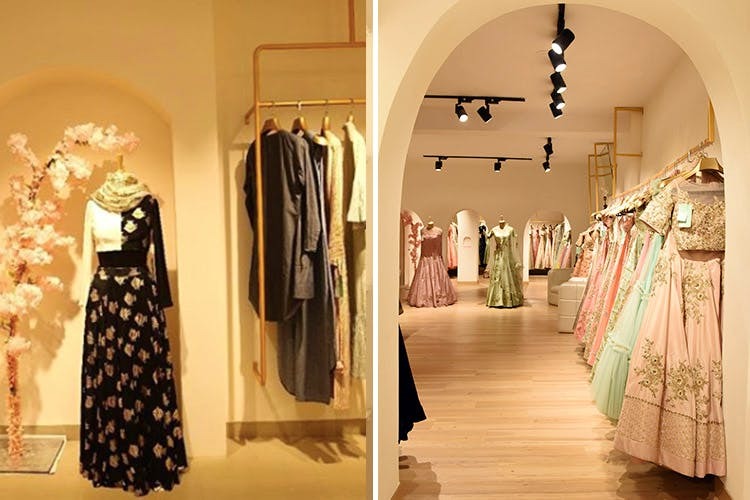 One of the most popular hubs for wedding shopping in the city, this is the first time the area will have fashion biggies like Masaba Gupta, Ayushi Bhasin and Shruti Sacheti, amongst others – all under one roof . Despite being situated in one of the small, bustling lanes of Shahpur Jat, the store is large and spacious – you can come and check out their stuff in peace without being rushed, or shoved around. Keep in mind, though – you’ll have to keep a nice, fat budget ready to shop here. But if you’re someone who’s been doing your research and know your designers well, this place is definitely where you and your bridal party should go to check out lehengas, saris, even accessories like shoes and potlis. It’s far more convenient than having to run to each designer’s individual showroom. Plus, they have a nice mixture of traditional and modern outfits, so there’s enough variety to choose from. The next time you’re hanging out in Shahpur Jat, or looking to go shopping for some designer outfits, pay Akilah a visit. You can also check out their Instagram page here.